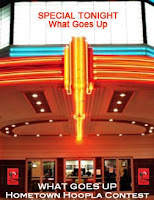 The producers of What Goes Up are pleased to announce the opening of the What Goes Up "Home Hoopla Contest" to win a screening of What Goes Up in your hometown. The first place prize includes a one night showing in your hometown (U.S. only) with complimentary admission for the winner and up to ten friends in June. The remaining seats will be open to the public for regular admission. The Contest. Write a letter, record some audio, or make a video that shares something about you, your hometown, and any other compelling reason to host a one night screening in your hometown. How To Enter. E-mail the letter or submit a link to your audio or video submission to whatgoesupinsider@gmail.com before May 25 and include "Hometown Hoopla Contest" in the subject header of the e-mail. First Place. A one night public screening in your town or city, with up to ten free tickets for you and your friends and other prizes as noted above. Third – Fifth Place. A theatrical movie poster signed by the producers of the film. Promotion Period. The Promotion begins at 7 a.m. EST on May 13, 2009 and ends at 12:01 AM EST on May 26, 2009, when all entries must be received. The first place winner must agree to identify the theater of their choice in their hometown (or nearby town) and work with the producers to help find a venue if that theater is not available. The official rules follow in the comment section of this post. Entering this contest does not preclude an individual from entering any other promotion.